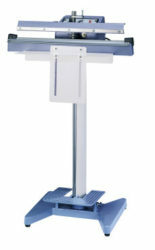 Foot Type Sealer, Designed for sealing various bag materials, such as PE, PP, PVC etc. Foot Heat Sealer, Designed for sealing poly bags polycello, PE, PP file coated with aluminum foil, tin foil, copper foil, OPP, OPS, PSP, glued paper etc. 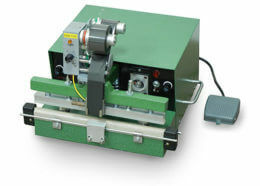 CC-HN series, Designed for sealing various bag materials. Automatic and continuous sealing with switch for foot control. CC-F series, Designed for sealing various bag materials. Ideal for users of shops, stores, wholesale distributors. CC-DF series, Designed for sealing poly bags polycello, PE, PP file coated with aluminum foil, tin foil, copper foil, OPP, OPS, PSP, glued paper etc.